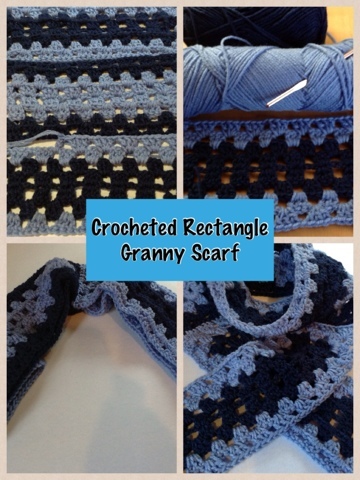 A week ago I started crocheting for the first time a granny rectangle. I got the idea from Ali Campbell @CrochetAli from Twitter. Ali is a crochet teacher and designer from the UK and she posts on her blog www.macscrochet.blogspot.com everyday what her students are working on and she was teaching them to make crocheted rectangles. Well I saw a pattern on www.favecrafts.com to make a crocheted rectangle pillow, but I thought that a scarf would be cute for me to use, so I am going to use it for our annual Christmas Fair that we have at our church. Here is a picture of the finished crocheted rectangle scarf I made! I am on Twitter, Ravelry and Pinterest. My username is @brklynhousewife. Please don't forget to follow me on Bloglovin too! All of my crochet/knit creations and recipes are on my Pinterest Boards, so please have a look there also. I love your scarf Julie! You really are a talented crocheter! Thanks Ali you are sweet and a talented crocheter too! No matter what I do I cannot get the pattern for the poncho and hat to open..?It's so frustrating I've been working on the page for 2 hours now..how do I get the pattern to open? Help?